Several months ago (January this year actually) I did a 2 inch postage stamp quilt that I really liked- such a great way to use up those scraps. Only problem was it was rather small - 41" x 52", more a baby sized quilt. I've enjoyed seeing it laying around on a chair or bed, but since a friend of mine is soon to be a grandma for the first time, I thought it might make a nice quilt for her to either use or pass on to her son and daughter-in-law. Here it is in the bottom left of the photo, with its newer larger sibling recently created. So I thought OK, I'll have another go, using two and half inch squares this time to make it a little larger to go on a single bed. (This one is a 57" x 77" now). So I did some of the 16 patch blocks by hand at night, then as I laid them out on the floor, chose a little more carefully so that the oranges and reds were more scattered over the surface. Another shot of some of all of those squares. So glad I didn't count them until I'd finished, not sure I would have kept going if I'd realised there were 824! Who am I kidding, of course I would have kept going. These things are definitely addictive! So I kept cutting more squares and adding to the blocks. 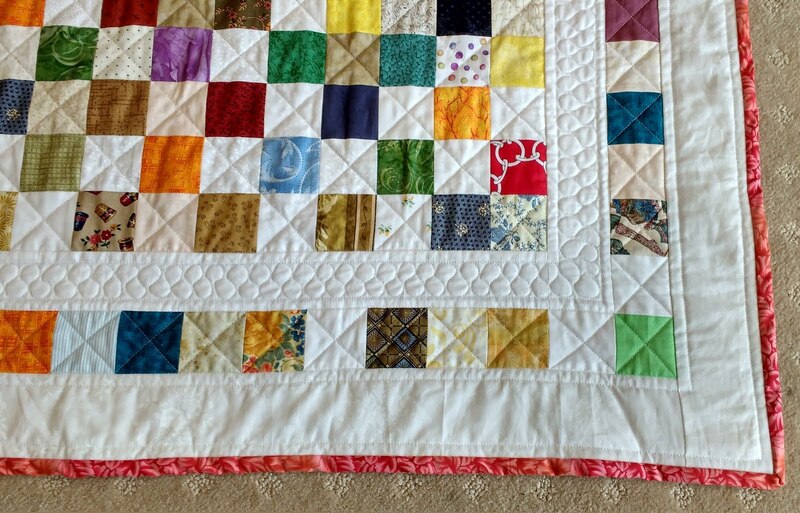 I sandwiched it a couple of weeks ago and did the straight line quilting only a week ago. For the first white border I was keen to try some 'ribbon candy' I think its called. 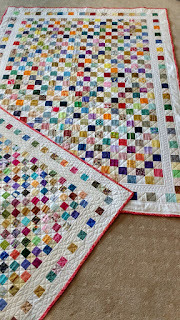 Scrap quits are great places to try new quilting I find. So I gave it a go. I'm quite pleased with the result, though corners will take quite a few more attempts until I'm happy with them. I realised that in order to do the final border, I needed to make sure I knew where to put the frames for the quilting I wanted to do there. So I actually put the binding on first - something I haven't done before on a quilt either. So having done that I'm debating about doing a more open figure eight kind of pattern in that final white border in the next day or so. Still, its usable now and I have all those lovely reminders of quilts I've made in the past - lovely to glance at it as I go by! One of my goals for August completed, so on to the next one I go - unless of course I get distracted along the way. 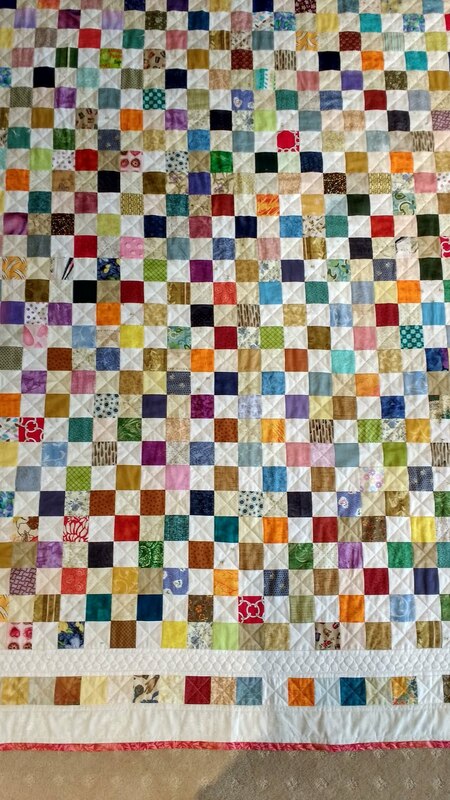 Scrappy quilts are my favourite and yours is no exception. Thanks Karen, I'm pretty happy with it. Beautifully scrappy! The quilting is perfect. Congrats on meeting your OMG for August. Thanks Kate, one down several to go! 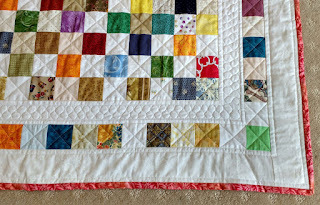 Both of these are such happy quilts - I love the border you have put around them too! Thanks Anne, still pondering that final white border, to leave or to quilt, that is the question! What a surprise, you stitched this right up! 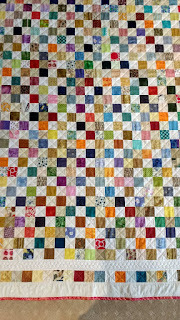 The ribbon quilting looks so pretty next to the patchwork. I think I probably have more than 800 squares now, but perhaps not enough lights to create great contrast. I wish now that I had seperated them as I collected over the years! Very pretty! I have a postage stamp (1.5")in process. Been working on it off and on for a year. They are addictive as I'd like to make another one in rainbow fashion now. Wow, 1.5" - true dedication! A rainbow would look amazing. wow! Those are all gorgeous quilts no matter what the size. It's fun to see how folks use up their scraps... too many of my scraps sit in big plastic bags. Sigh. Hey Bonnie, little by little gets it done. I find starting with just one block is inspiring, but there are so many projects as possibilities aren't there? 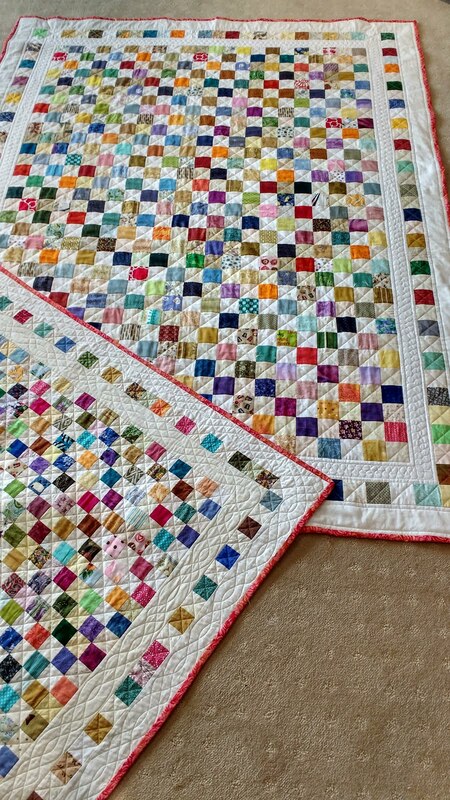 Very pretty quilts with the ribbon candy quilting on the white borders. Thanks Vic, I think I'll have a go at the ribbon candy again. I want to make a postage stamp quilt one of these days! Congrats on meeting your goal! Love this. Great way to use up those itty-bitty scraps! Please tell me, were your squares cut at 2", or did they finish at 2"? I have a pile that I have cut at 2", and I'm thinking I must be crazy!